1) Are you more of a Morning, Day, or Night time person? 2) Something you struggle with on a day to day basis? I am absolutely enthralled with Moose. I have no inkling as to why, but I do! My favorite color is grey, though it is a tone technically. So for a true color I would say an azure blue. Lately I have been liking light coverage foundations, even tinted moisturizers, with a dewy to semi matte finish. 7) What do you do in everyday life? If you’re a student what is your major? I am a student in High school in the IB program or International Baccalaureate program, the highest level of high school education in the world. I plan to study Art in college and go to an art school. 8) First makeup brand that really got you interested in cosmetics/ nail polish? The first brand was Too Faced since it was the first makeup product I ever got, but the brand that sparked it all was MAC. 9) Do you have any makeup, nail polish or skin care items that are perfect for you? (HG items) If so which- include shade names please. My holy grail moisturizer is FRESH Soy Face Cream! So nice on sensitive skin. As for makeup, The Bobbi Brown Tinted Moisturizer In Alabaster, Make Up For Ever Face & Body Foundation in 38, Make Up For Ever Mist & Fix, Atelier Maquillage Eye shadows, and Revlon lip stains. 10) What is your favourite food? Drink? Probably between pearls and my birthstone, aquamarine. I did, but sadly I lost her in a freak occurance about two months ago. Her name was buttercup and she was my beautiful yellow lab. 13) One place you’ve never been that you want to visit? I have a list of twenty three places I would love to travel to but the major ones are Paris, Berlin, and Stockholm. 14) What inspired you to start your blog? 15) What are some of the most useful things you’ve learned about since you started blogging? I've learned that a camera on macro setting in natural sunlight, without flash, makes a world of a difference in pictures. And having a clean looking professional looking blog layout really attracts new followers. 17) What do you use to take your blog photos? What type of computer? I use a Nikon D40 on Macro setting. I use a Macbook Pro. 18) What genre of movies/books do you like? For movies I really like fantasy, fiction, and mysteries. How can I forget Love stories? All of those genres are also my preferred genres as far as books go too. 19) Other hobbies or events that you’re involved in? I love vintage/ inspired clothes. I call that my hobby because I collect many items every week! I also am a tour guide in my city for people that speak french as their main language. I don't know much, but I know just enough! I live in a big tourist spot in Florida, St. Augustine, so I guide the french around and talk them through all that there is to absorb! 20) Most unique eyeshadow you own? Oh thats tough. I would probably have to pick two. Kat Von D's Sugar Skull, and Fyrinnae's Anemone. 21) Most unique lip product? I love NYX's Orchid Sparkle, and Dior's Lip Glow. 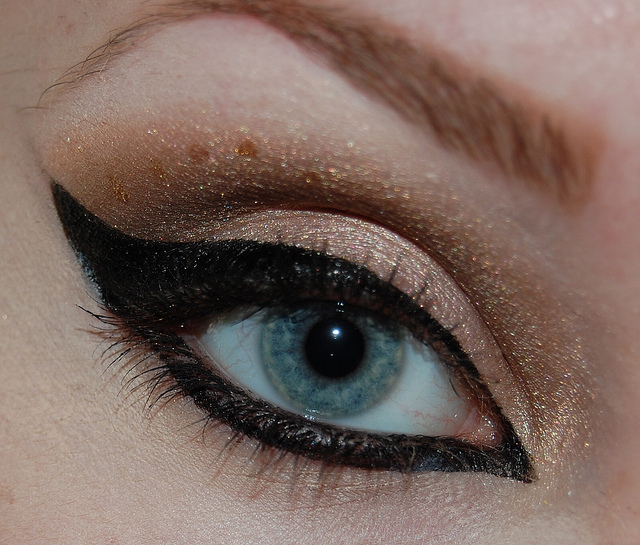 As far as eyeshadows go, I would say light teals with grey's. For lips I like taking a fuschia lip color and adding a gloss with a purple duo-chrome. 23) Favourite piece of jewelry? Why is it your favourite? I love my pearl earrings. I love them because they are so classic, and elegant. You can wear them with anything and I think it really compliments my face shape. 24) Best drugstore product you’ve tried? The Milani Liquify Eyeliners or Wet N Wild Eyeshadows. 25) Random fact you'd like to share about yourself? I can speak french, Im a vegan and I am Norweagan. That was three but I feel all rather important. 26) Favourite Nail Polish Brand and why? 27) Most unique polish you own, why? Probably Zoya's Gemma or OPI The One That Got Away. 28) Favourite polish colour to wear? I like to wear dark colors on my nails, so anything that falls into that category is fair game. 29) What are the best top coat, base coat, treatments you’ve tried for your nails? The best top coat by far is the one by Out The Door. The base coat I prefer is the one by Sephora by OPI. Her skin is FLAWLESS. I would love to know what product she is wearing specifically. Crazy to think she is only 16. 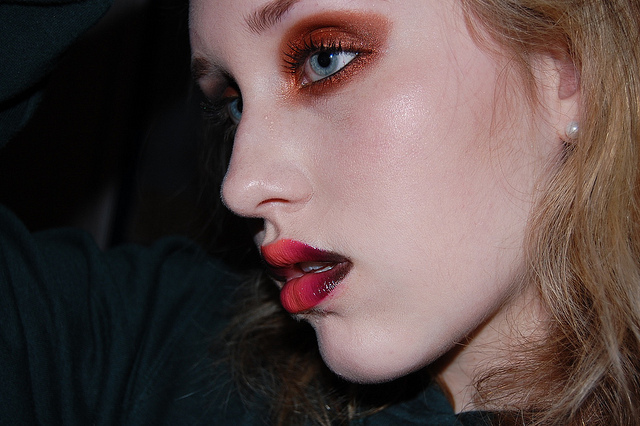 Also, her lip makeup = amazing. Gorgeous. Lovely interview with her, by the way!